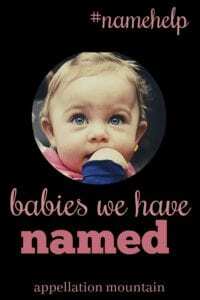 Curious about babies we have named? After all, #namehelp posts have been running for ages. The first one was posted all the way back in October of 2014. In other words? Some of those babies we have named are walking, talking, and probably headed to preschool in a few weeks. 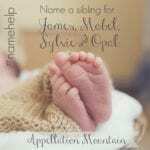 Our very first #namehelp asked for names for a brother for Zachariah Tom. Make that middle names mostly. The family welcomed son Vincent Ford. 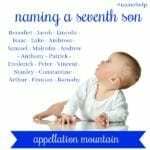 A mom started out looking for strong names for girls, and ended up using something a little different. Baby number seven turned out to be lucky Clover! Giacor was expecting her first, and looking for a Southern name for a girl, and advice about using family names for a boy. As it happened, they had a son, and stuck with James Joseph V. But they call him by the one of the nicknames we discussed in the post – Quinn. Such a good solution! 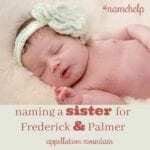 Naomi chose a gorgeous name for her third child, a sister for Lauchlan and Cordelia. I’m so glad they chose it – it was my favorite! Sullivan “Liv” Kate wasn’t on Emilie’s original list, or on my suggestions. But I think it’s the perfect solution to her hunt for a unisex name for a daughter. Kate and her husband went with William “Will” Michael for their first child together. Michael is dad’s name, and William comes from Kate’s side. Melissa adored her daughter’s name, Eliot Montgomery, so much that she thought they’d never top it! But I think the name they chose works beautifully well: Brooks Roosevelt. How gorgeous is Paloma? Better yet, those two middle names honor three grandmothers: Diana, Lila, and Fernanda. Perfection! Cressida Caye’s middle name mirrors her older sisters: May and Shae. But it also potentially allows the family to use the nickname Cece, which is what prompted her parents to ask for help in the first place. Jane Ashley and Claire Samantha were joined by little sister Rose Bethany. The middle name is a nod to grandmother Beth. Renee wrote in asking for help naming Georgia Louise’s little sister. After much thought, they settled on Betsy Rupert – Betsy Roo! And that’s just the very first year of babies we have named! We’ll pick up with November 2015 onward in the next installment. 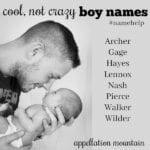 Got an update to your #namehelp post? Email it to appmtn (at) gmail, or post it here and I’ll include it in a future edition! You helped name our Rose Clora! Thank you for posting these updates! I always wonder and it’s great to hear what name the parents chose. Yes. So excited about this series! I do remember a couple of these (particularly Alba Rosamund Eve because how gorgeous is that?). Me too! I am always left wondering what name they chose. Thank you, Abby!